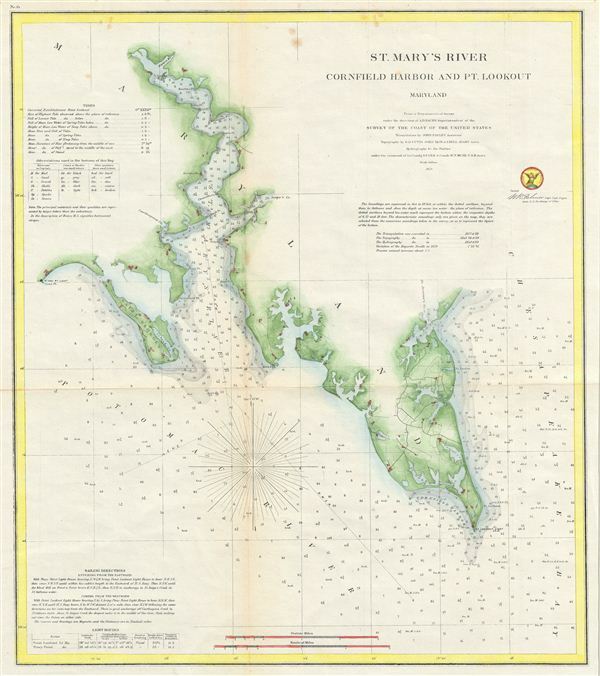 An uncommon example of the 1859 U.S. Coast Survey nautical chart or maritime map of Maryland's St. Mary's River and Point Lookout. The map covers from Piney Point and Saint Georges Island, past St. Mary's River, eastwards as far as Point Lookout. Several roads and various small towns and farms are noted throughout. As a nautical map it further features countless depth soundings (in feet) and a wealth of practical information for the mariner. The triangulation for this map was completed by John Farley. The topography is the word of R. D. Cutts, John Seib, and I. Hull Adams. The hydrography was accomplished by a team under the command of S. P. Lee and W. T. Muse. The whole was compiled under the direction of A. D. Bache, one of the U.S. Coast Survey's most influential and prolific superintendents, for issue in the 1859 annual report to Congress.